Sometimes, you come across a recipe that’s just a great recipe. There’s no incredible back story. It’s just something so delicious, you have to share it with everyone you know. Case in point: I was lying on a hot and sweaty yoga mat staring at the ceiling. My mind drifted to the recipe archive that lives in my head, eventually making it’s way to zucchini slice. I’ve made it a million times. It’s incredibly addicting. And it’s going to change your attitude towards the mighty summer squash. 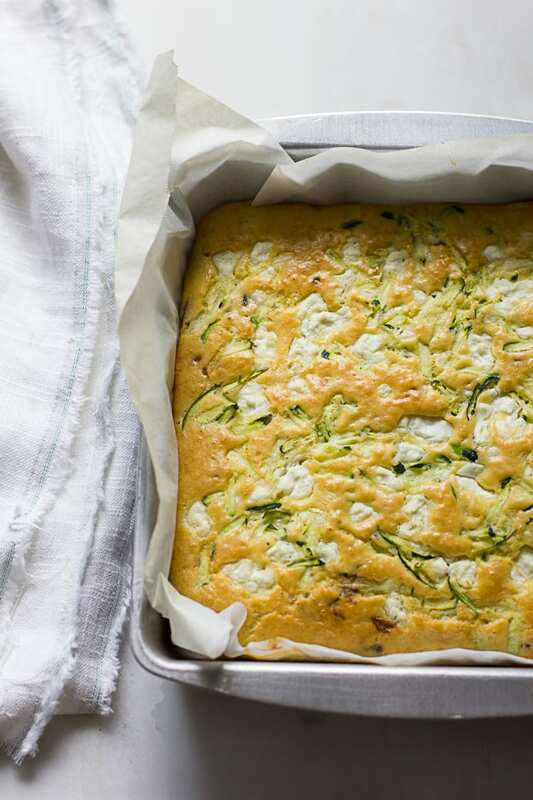 Zucchini is one of those vegetables we all love when it first arrives onto the scene, then quickly fades into the doldrums, like a boring relationship. At first glance, it might look like an eggy frittata but it’s not even close. 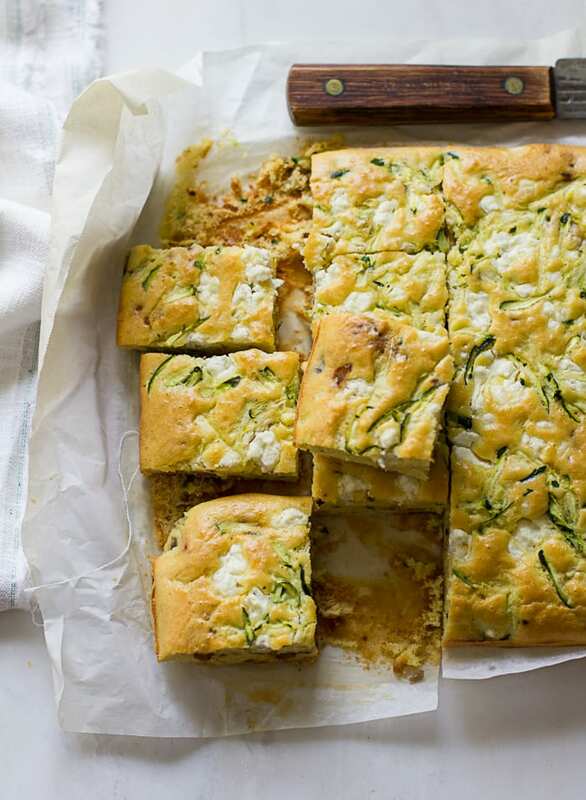 Zucchini slice is a typical Australian recipe, commonly enjoyed as a light lunch or snack. It’s super easy to prepare. What makes it unique in my opinion, is the texture. Combine the creamiest quiche with a bite of fluffy, savory corn pudding (minus the corn), and that’s what this tastes like. (I know- that doesn’t even make sense). Allow me to rephrase: it’s soft, light, airy, and not stiff or rubbery at all. I think it has something to do with the 2 teaspoons of baking powder folded into the mix. Now, I call this the ‘ultimate’ zucchini slice because it took me a couple of tries to get it to blog-worthy perfection. This can be a real problem in baking because it creates unwanted sogginess. The key is to drain most of the water from the zucchini before adding it to the batter. If you’ve made zucchini bread before you know exactly what I mean. Place the grated zucchini in a clean kitchen towel, twist it up, and squeeze out as much water as possible. 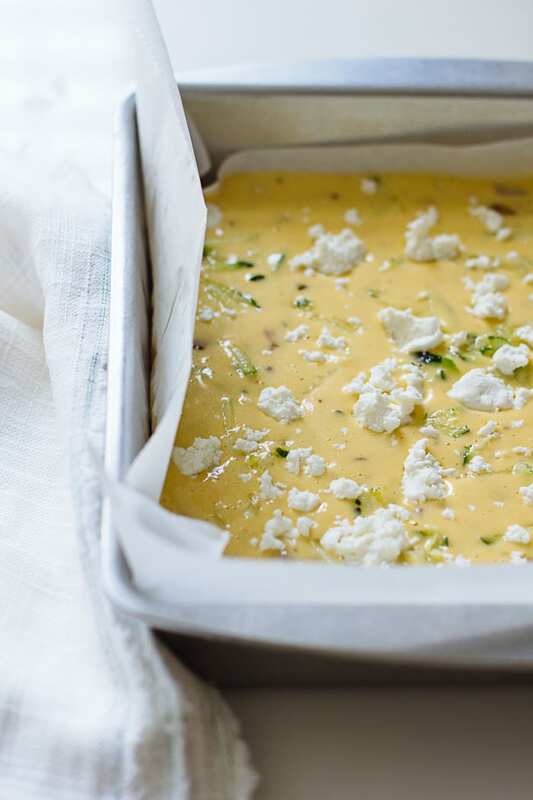 Then mix all of the ingredients together and you’re on your way to zucchini slice heaven. This is my idea of zucchini zen. The whole family loves this recipe (even the boys!). Make it once, and you’ll see what I mean. I use thick-cut Applewood smoked bacon for it’s smoky-sweet flavor. You can easily find this in most grocery stores, but in a pinch, regular bacon will do. Substitute any cheese that you’d like in place of the goat cheese. Try folding in 1 cup of shredded sharp cheddar, Gruyere, fontina, mozzarella (or a combination) into the batter. Line an 8x8 square pan with parchment paper for easy removal. Coat with cooking spray (even when lined with parchment, I've found that the eggs occasionally stick). Using a box grater, shred the zucchini. Line a bowl with a clean kitchen towel and place the zucchini inside. Twist it up to close, and squeeze out as much liquid as possible. Set the zucchini aside until ready to use. In a large non-stick skillet, sauté the bacon (no need to for oil) over medium-low heat, about 2-3 minutes. Add the onion and continue to cook until soft. Meanwhile, crack the eggs into a large bowl. Add the olive oil. Season with black pepper and whisk well to combine. Toss in the sautéed bacon and onions, and the reserved zucchini. To the bowl, add the flour and baking powder. Continue to mix until it looks like pancake batter. Pour into your lined baking pan. Sprinkle the goat cheese over the top. Bake until the filling is set, about 40-50 minutes. The top and bottom should be deep golden brown. Rotate the pan halfway through cooking time for even browning. Remove from the oven and cool for at least 10 minutes before slicing. You are very clever. Sounds terrific. Thank you and have a great day! Thank you, Liz! I hope you enjoy! Just the thing I need to put into cold boxes that are headed up to the fields during harvest. Now need to wait for my courgettes to ripen. Absolutely, these would be perfect… with a Harvest bar for dessert? Currently making my grocery list with everything I need to make this. I love everything about it and can’t wait to taste it! Whoa, this is such a cool recipe!! I’ve never seen anything like it! If words can sound ‘pretty’, than courgettes (and possibly aubergine) take the lead! Love it. Your ultimate zucchini slice looks mouthwatering, and yes, it does resemble frittata :) In fact, I think your recipe just inspired me to make a vegan frittata. I totally agree, getting excess water out of grated zucchini is very important when baking. Sounds great and looks great thanks Emilie! This reminds me of the zucchini bread my mom used to make. I haven’t seen a version like this since I was a kid! Thanks for bringing me back to some great memories of running inside to the smell of a deliciously fresh baked summer treat. I will give it a try! This looks fantastic! 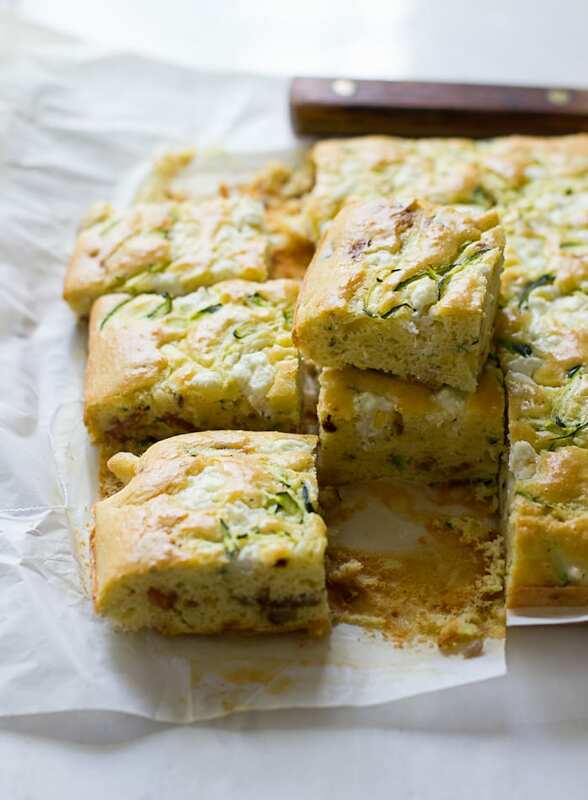 I have never made a savoury zucchini bread before. There are a couple of monster zucs in the backyard right now and my boyfriend has called a few to make his amazing zucchini relish… but I might just have to steal one to make this! This looks fabulous! But then, I love zucchini, and use it in my cooking in so many ways. One of my favorites is similar, but it’s actually savory pancakes. You can play with the batter, adding walnuts and parsley or anything, really… Cheers to zucchini! 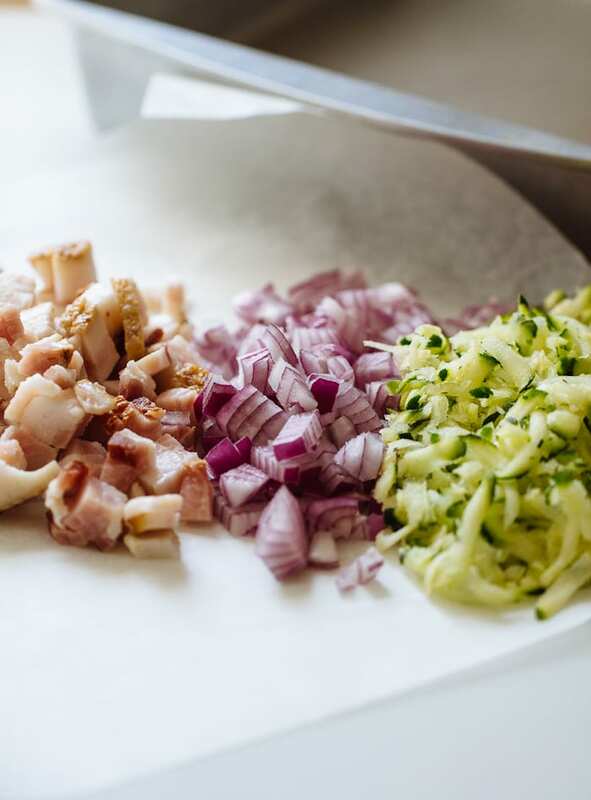 Yum, you had me at walnuts and parsley… See, that’s what I love about recipes; they’re meant to be adapted. thanks for the inspiration, Mimi! My mind takes me all over the place when I’m on my yoga mat. Totally hear you. And this…looks delicious. So good! Can’t WAIT to make this one Emilie! Zucchini just needs to evolve a bit more in my kitchen and this is a fabulous start! Yum, Yum, Yum! This looks like such a great entertaining recipe. Perfect! I love Tabbouleh and my husband loves anything with cauliflower. Sounds like a winning combination I’ll be preparing soon! Has anyone tried freezing this? Thanks! Have you made this as a gluten free option? Maybe brown rice flour,garbanzo bean flour or coconut flour? No, I have not made this with GF flour. You most certainly can try! I would be careful with coconut flour though, it tends to be very ‘thirsty’ so it won’t be an exact replacement by measure. If you experiment, do let me know! This looks yummy! Bought zucchini yesterday just to make this recipe! It looks like a LOT of oil….have you ever tried it with less? Planning on adding some spinach, mushrooms, and red pepper to the batter and topping with green onions to serve. Do you think a little chicken added would be OK? Thanks! It’s a very tasty recipe. I haven’t tried making it with less oil, but feel free to experiment! I think a little chicken would be fine, but not too much. You don’t want all of the fillings to make the slice heavy and dense. I was having people over for brunch and in a rush to make something. I whipped this up in no time at all. It was so easy and so delicious. Thank you!! What is the nutrition for this? Hi Peggy! Sorry, I don’t have the nutrition info for this. However, there are several online tools you can use to find out the details.